Whether you are planning to have an intimate wedding or an exorbitant one, N.K.T. Raghuvanshi Hall will surely match your unique choice, budget, and requirements. With a capacity of accommodating up to 450 in seating and 1000 in floating, the venue has a cosy and comfortable interior for the guests. It also offers an in-house team of caterers that puts all the efforts to delight the guests with mouth watering multi-cuisine dishes. N.K.T. Raghuvanshi Hall, Chembur, Mumbai is ideal for hosting your weddiing and reception ceremony. The venue is reasonably priced, is professional with skill and efficiency making it a most sort after venue among its locals. They serve up an excellent menu of vegetarian food in a mix of Indian regional and International cuisines. 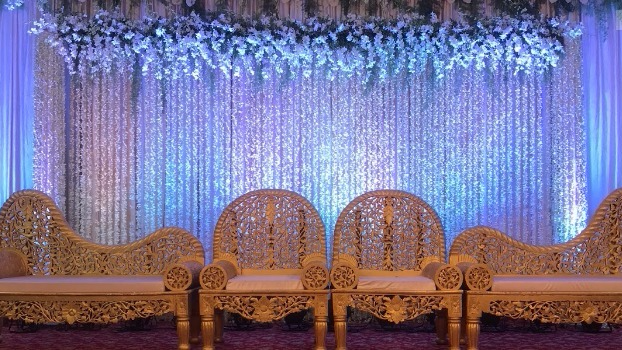 The venue also takes care of the decoration for your big day. The banquet hall can accommodate a huge crowd for your function. The venue is simple yet looks elegant and has an inviting ambience. N.K.T. Raghuvanshi Hall, Chembur, Mumbai offers complimentary changing rooms for the bride and the groom on their special day.